Perfect product for your dorm room walls too! Add Extra Markers (Set of 4)? Dry erase boards are one of the easiest ways to decorate your dorm room. Our 9.5'' x 12.5'' Dry Erase Board can be used for both dorm decoration and studying. Mounting this board on your dorm room wall and writing reminders to yourself is a great way to stay organized in college. Or try simply keeping it on your dorm room desk and using it to work on homework or study for exams. 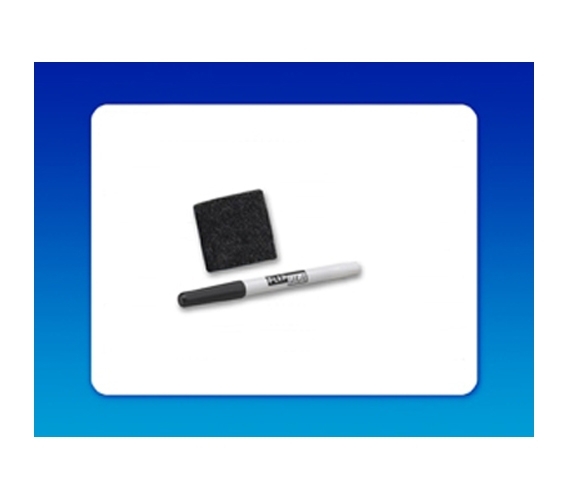 The dry erase marker and eraser come included with this dorm board, making it an affordable and useful college supply. The lightweight and durable material of this board make it a versatile dorm room supply that will help you study, stay organized, and add decoration to your dorm room. Our dry erase board is ideal for any college student from math majors who want to work on practice problems, to busy dorm students who want to stay productive and organized. Our dorm company offers a wide variety of differently sized dry erase boards that are sure to satisfy the various decorative and studying needs of college students.